Eileen Robinson was so excited when I asked her if she would be interested in being featured on Bold Blind Beauty! Her excitement was so contagious it made the rest of my day. 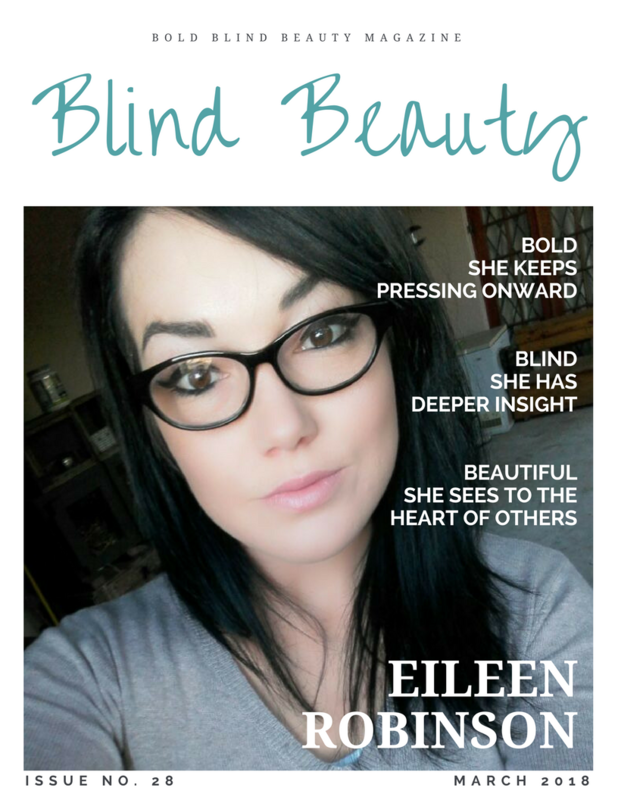 Eileen, aka The Blind Gypsy (her Instagram handle), is so fierce I couldn’t wait to introduce her to you. Ignorance may be bliss, however when you have a degenerative eye disorder it’s not. Retinitis Pigmentosa (RP) is killing my eyes slowly but my heart and soul have never been more alive. I’m just a normal girl (who is animal crazy, loves makeup, and all things pretty) living in this lovely crazy place we call planet earth. I was an ignorant fool before my diagnosis. To put it bluntly, I was vain, always worried about what people thought of my appearance. Funny thing is with RP I won’t be able to see myself age one day, so who cares right? It’s what is on the inside that counts, never judge a book by its cover; all those clichés, which are true. RP was a blessing in disguise. My mission is to help others who are frightened and don’t know how to handle their condition. Because let’s be honest, having a visual impairment is very scary. You do not know what to expect, as each day is different. I was diagnosed with RP last year February 2017, I was in denial for a very long time and an emotional mess. However, I have accepted my fate in life now with the help of my awesome fiancé and great family and friends and couldn’t be happier. I may trip and fall, but I will get up, fix my hair, hopefully, my makeup didn’t smudge and carry on. Laughter is the best medicine. Let’s make visual impairment beautiful. I’m so proud of your mission of helping others, thank you for sharing! Eileen’s story is inspirational Steph. Thanks for featuring her. She is a wise woman for one so young. While we learn to cope with all manner of sensory shortcomings – mine is hearing – something is also gained in the process. I think I remember you telling me about your hearing and I cannot imagine what it’s like living with hearing loss. However I agree with you that in our loss there is so much to be gained it’s really not clear until you experience it. I’m impressed by your ability to laugh, not at, but with yourself. It’s a hard thing to do. George I don’t know if you follow Eileen on IG but she’s a real hoot. I wish I could meet her in person because she has an amazing personality that comes through very loud and clear on her posts. She seems like such a fun-loving person and one who loves to laugh. I just now began following her. I mentioned that you suggested I follow her. I trust that was okay. Thanks. Oh yes, that’s totally fine George. I think you’ll like her energy and enthusiasm.